Check out this totally cute story from wildbearpajamas which proves once and for all that dogs are better than cats. My mom’s friend adopted this lovely dog after he was abandoned by his previous family. His name is Shaun. Shaun had always been very good at eating all his food. Every last bit that was, he ate it. One day he started leaving a little bit behind. He wouldn’t eat everything, no matter what. He always left a little behind. Every morning when my mom’s friend checked Shaun’s bowl, the food was gone. That was very strange, because Shaun always spent the night by her side. One night she decided to investigate the food situation. She waited quietly by the food bowl and then, in the middle of the night, a cat came through the window and ate the remaining food. She noticed the cat was actually pregnant. 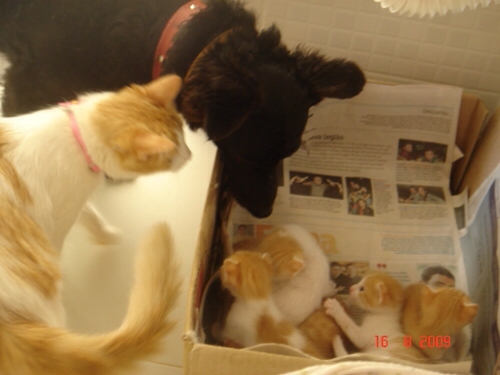 A week or so later the cat came into her house and gave birth to 6 little kittens. Shaun took care of them as if they were his own babies. My mom’s friend adopted the cat too (her name is Meow) and they took care of the kittens until they all found a loving home. 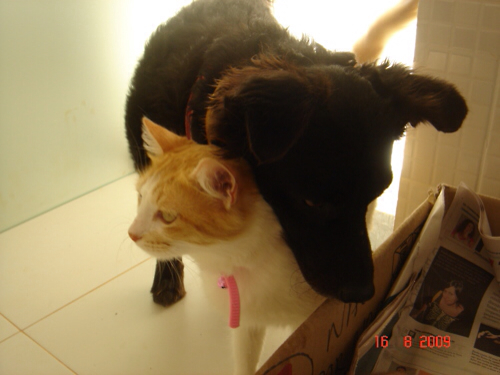 Nowadays Meow and Shaun live happily together as a family and they each have their little bowl of food. I know! I need a dog. Don't tell my BF.